We have drywall! Since the last update the house has been insulated and all of the drywall is up. They also did the first coat of mud. We also upgraded our hot water tank to gas. My husband was a little frustrated with that situation because we were never given an option to upgrade the hot water tank. Luckily we were able to switch, no problem, and not charged a fee for changing it so late. Not too many pictures to share because all of the work has been on the inside lately! There is another house going up across the street from us - it is the same model as our house except they got the bonus room over the garage. Not sure what I think about it. Yes, the added space would be great, but I just don't care for the way the house looks with it. Too boxy or something. 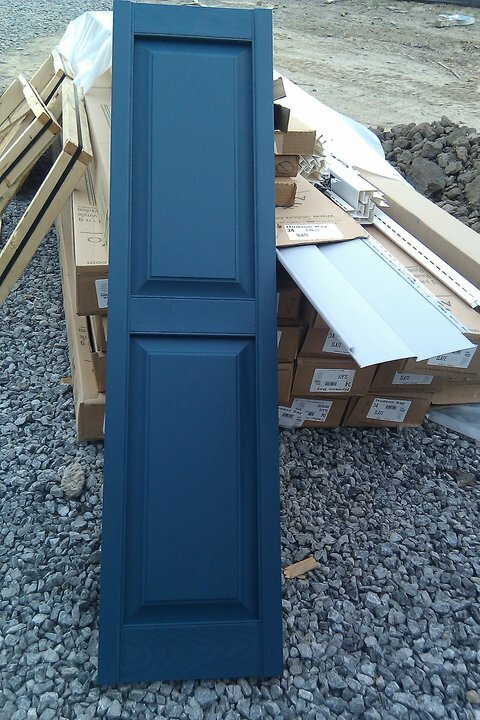 Here is the siding and shutters we picked. I don't remember what the colors are called exactly. 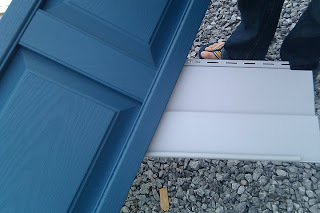 The siding is a light gray - stone maybe? And the shutters are classic blue - I think. Your situation made me curious about ours. It is electric and gas wasn't an option on the upgrade sheets. When I emailed our sales rep, she said it would be $1,750. Is the number we were quoted close to what you paid?